The irregular shape of this panel suggests that it must have been located at the top of a window in a church. These are known as ‘tracery lights’. 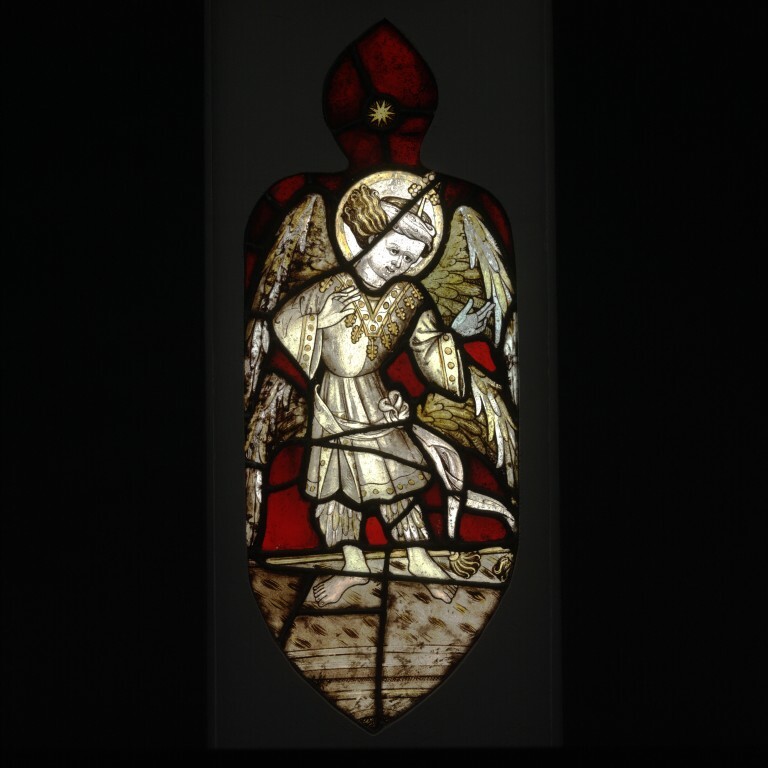 The angel in this panel has a set of four wings instead of two. This identifies him as a cherub. Angels, celestial creatures, figure prominently in many of the world’s religions. Christianity inherited its devotion to angels from the Jewish faith from which it emerged. From early on, the great theologians of the Christian church devoted much effort to identifying and understanding the role of angels in God’s creation. About the year 500, one scholar wrote a treatise called ‘The Celestial Hierarchy’. He scoured the Old and New Testaments for information relating to angels. From this he compiled a list of different types of angels according to their functions. He claimed that there were nine orders of angels, divided into three hierarchies. Each order had a specific function, such as the Order of the Archangels, who act as messengers between God and mankind. The author of this treatise is known as the ‘Pseudo-St Denis’ or ‘Pseudo-Aeropagite’, because he was once thought to be the St Denis (or Dionysus) the Aeropagite who is mentioned in the New Testament Book of Acts. The first hierarchy of angels consists of Seraphim, Cherubim and Thrones. They encircle the throne of the Godhead and protect the Ark of the Covenant. According to the Book of Genesis, God sent the Cherubim to drive out Adam and Eve from Paradise, after they had eaten the forbidden fruit. The Cherubim also guard the Tree of Life. In medieval art the Cherubim acquired four wings, probably in reference to the vision of the Prophet Ezekiel. Panel, with a trefoil top, from a tracery light, set in a clear modern panel. An armoured angel, in black and yellow stain, on a ruby ground. Lower portion restored. Because of its irregular shape, it is clear that this panel must have been located at the top of a window in a church. These are known as 'tracery lights'. The angel in this panel has a set of four wings instead of two. This would identify him as a cherub. Angels, divine creatures, figure prominently in many of the world's religions. The Christian religion inherited its devotion to angels from the Jewish faith, out of which it emerged. From early on in the Christian church its great theologians devoted much effort to identifying and understanding the role of angels in God's creation. Around the year 500, a church scholar wrote a treatise called 'The Celestial Hierarchy'. The author of this treatise, known as 'Pseudo-St Denis' because formerly he was thought to be St Denis the Aeropagite who is mentioned in the New Testament Book of Acts, scoured the Old and New Testaments for information relating to angels. From this he compiled a list of different types of angels according to their functions. He claimed that there were nine Orders of angels divided into three hierarchies. Each Order had a specific function such as the Order of the Archangels who act as messengers between God and mankind. The first hierarchy of angels consists of Seraphim, Cherubim and Thrones. The Cherubim encircle the throne of the Godhead and protect the Ark of the Covenant. According to the Book of Genesis God sent the Cherubim to drive Adam and Eve out of Paradise after they had eaten the forbidden fruit. The Cherubim are also guarding the Tree of Life. In medieval art the Cherubim acquired four wings probably in reference to the vision of the Prophet Ezekiel. Panel of clear and flashed glass with painted details and yellow (silver) stain. Depicting an angel. Made in England (Norwich), c.1460-80). This angel, together with three others in the Museum's collection, came from tracery lights in the same, as yet unidentified, church. They are clearly products of a Norwich workshop. The style of the angels and the distinctive feature of the pedestal decorated with the 'ears of barley' pattern are common to that city in the second half of the 15th century, and several churches in Norfolk retain similar angels.